Fujifilm, a Japanese brand, known for its cameras and lenses, comprises a broad spectrum of products. The brand has a presence on social media through Facebook with over 1.9 lakh fans, Twitter with over 1K+ followers and Youtube with 97,000+ views. For a brand, these figures seem to be low but the company is now plunging into social media through various applications. 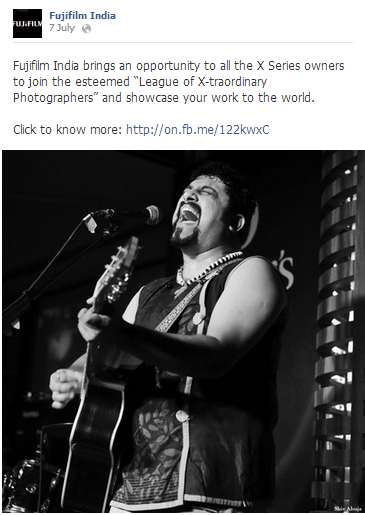 Fujifilm India has launched a community on Facebook called “League of Xtraordinary Photographers”. 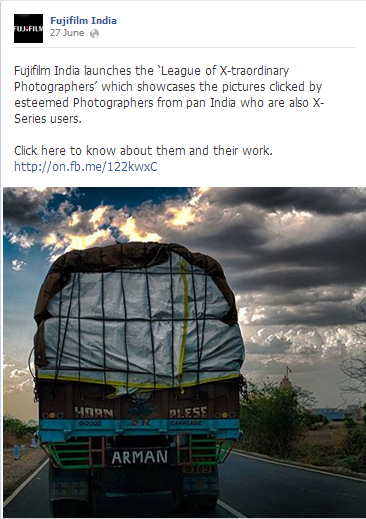 It is aimed at bringing together all the X Series users in India who are also Photography enthusiasts. Fujifilm aims to promote the X-series range of cameras through this application. 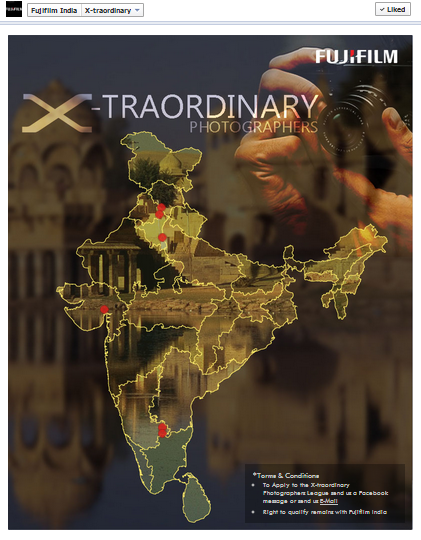 The brand launched an application named X-traordinary on their Facebook page. This application invites users to submit 8-10 photographs taken by any X-series camera along with their profiles either through a Facebook message or through an Email. Once the users share their work, the brand will review it and upload it as an album on their Facebook page. Fujifilm is promoting the application through Facebook posts. On Twitter, the company account tweets about the application with no specific hash-tag, but is also promoting the X-series with informative tweets on the same. 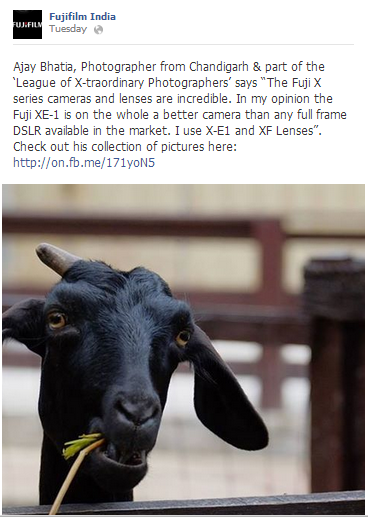 Fujifilm is encouraging photographers by appreciating and sharing their work. This activity will definitely help in building positive interactions about the brand. Through Facebook posts, customer testimonials are being published. This encourages further participation and also motivates the users to make these posts viral. People love to share among their friends and family when their work has been published by a brand. Promoting a particular series through an application is an interesting way of promoting your products. The name X-traordinary resonates with the X-series, creating a recall value. There is no like-gate on the application. This would have ensured the brand more likes since fans would be curious to know about the contest. New take but an old approach. The campaign has a feel of the same old photo upload contest which increases the capacity to go viral. However, since it is a photography brand, this is probably pardonable. The unforgivable act however, is that it is very difficult to locate where the user photos have been posted. There is no promotion of the same through the app. Rather; the photos are uploaded as an album on the page which seems amateurish. It would have been advisable for the brand to upload the pictures through the application, creating like, tweet, share buttons under each to increase chances of the photos or the application going viral. The application doesn’t hint over any gratification for the best photos. This would have encouraged the participants more. On Twitter, no hash-tags have been created for the promotion. There is no innovation in content of the tweets. A plain simple appeal to participate has been raised by the brand. A contest on Twitter to promote the application on Facebook could have done wonders to increase interaction.